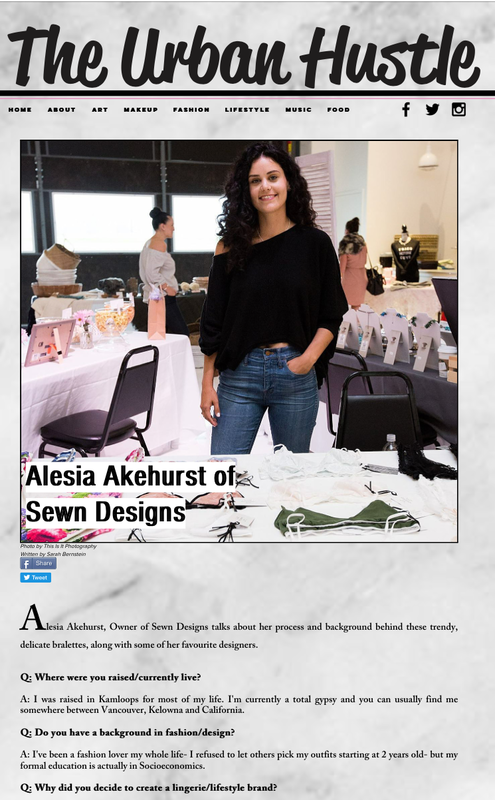 The Urban Hustle did a fun little interview with us about how Sewn began and included a shoutout to my fave brands! Check it out! Holly Baker from HGTV wrote the sweetest blog post about her new Pantone Bralettes! #Blushing! Click here to check it out. Shannon Livewell had the absolute SWEETEST things to say about Sewn! So well written and exactly what you go through when you receive your Sewn bralette. Check it out! Keisha from Loving Littles Blog talks about her recent Sewn Designs purchase and how bralettes are for moms too! Read the post here. Gurleen from Pink Tea Latte had so many nice things to say about Sewn! Oh and her pictures are amazing! A new Sewn Designs Q&A has been posted on Stylust Magazine! Also check out our Instagram to enter our giveaway! Sewn Designs is one of the independent designers featured in the Other Vancouver Pop Up Shop and we did a little Q&A, click to check it out! Codi Lynn from Creative Wife & Joyful Worker has released her list of Stocking Stuffers for Mom and included Sewn's Indie Bralette! More here. Thanks Elle Quebec for listing Sewn's Pantone Bralettes as a must have summer piece! Check it out here. Summer from The Mischievous Fox featured some ah-mazing pics of her Sewn bralettes! Check it out! Another article for Mom's! The Fam Jewels did a sweet blog post on Sewn and we're giving away a Wanderlust Bralette! Kristie from KristieJeanPhotography started up a blog and did an AWESOME interview with Sewn Designs!! Click here to check it out! Ana of @annieminnie lingerie featured Sewn in her series of interviews! Her questions were so amazing and thought provoking, check it out! Michelle from Roasted did a super sweet write up on bralettes and Sewn was included in her picks! Check it out here!